So, remember a while back when someone photoshopped a photo of a squirrel unzipping his fur to reveal a Superman costume underneath? 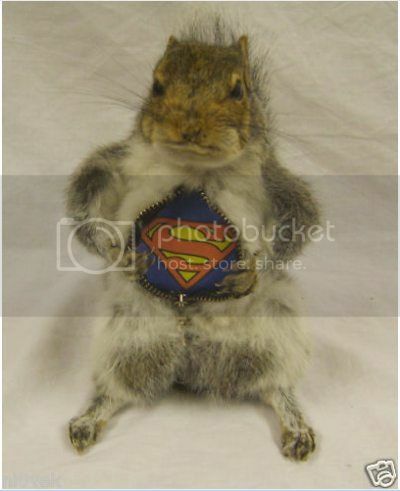 Well, thanks to taxidermy and the special breed of insanity fostered by the internets and monetized by Ebay, we now have an actual squirrel unzipping his fur to reveal a Superman costume. Favorite comment from one of the U.K.-based taxidermist’s many satisfied customers? Very good work… Excellent packaging…. now to hide it til christmas!!!!!! Indeed. You wouldn’t want to ruin the surprise.